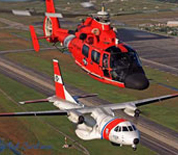 US Coast Guard Air Station Miami is located in Opa-locka, Florida at Opa-locka Executive Airport. The air station conducts search and rescue, homeland security and environmental protection missions in the Southeastern United States and Caribbean using the HU-25 Guardian and HC-144 Ocean Sentry fixed-wing aircraft and the HH-65 Dolphin helicopter. This USCGAS Miami directory features the critical info you’ll need to navigate through the many facilities and recreational opportunities available on base.